Pearl millet (Pennisetum glaucum (L.) R. Br.) a robust, quick growing, summer cereal with large stems, leaves, and panicles. Plants are tall and vigorous, with exceptional grain and fodder yielding potential, and are regarded as a coarse cereal in the category of maize and sorghum. Generally, pearl millet is considered more efficient in utilization of soil moisture and has a higher level of heat tolerance than does sorghum and maize. It thrives on light-textured and well-drained soils, and is grown extensively in the drier areas of Asia, Africa, and Americas. Pearl millet plants have variable number of tillers, variable panicle length, seed size, seed color, and plant height, depending on the cultivars and environments. 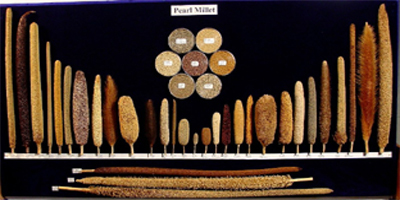 Pearl millet has been used as a cereal for nearly the last 3000 years in Africa and parts of the Near East. The crop is cultivated for both forage and grain. It is grown on about 26 million ha in many countries of southern, eastern western, and central Africa, a few countries of Asia, particularly in India, and in some parts of the Americas, and Australia. Pearl millet is grown in areas with rainfall of 125-900 mm. It grows on a wide range of soil types, but is best suited to light sandy soils. It is often grown in warm regions overlapping sorghum cultivation (above 400 mm isohyet) and other crops. The crop is less tolerant to waterlogging and flooding than sorghum. It is often grown on poor soils, but the crop responds well to good management, such as irrigation and fertilization. Click here for Taxonomic classification of Pennisetum sps.